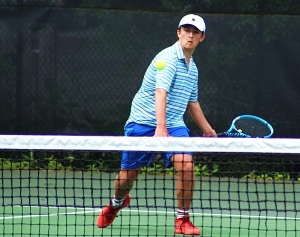 The Chamblee Bulldogs, Dunwoody Wildcats and Tucker Lady Tigers joined the Chamblee Lady Bulldogs in their respective Elite Eight rounds of the state tennis tournaments with victories on Wednesday. 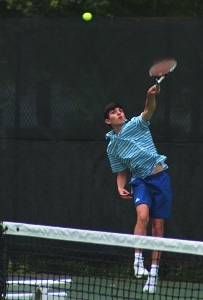 A hard-fought match between Chamblee (15-4) and Woodland-Bartow (11-7) went to the Bulldogs 4-1 in the second round of the Class 5A Boys’ State Tennis Tournament at Chamblee on Wednesday. The match was tied 1-1 after Woodland’s Blake Bottegal powered his way to a 6-4, 6-1 win over Chamblee’s Chase Starks (10-6). It evened the match following Chamblee’s No. 1 doubles team of Dixon Hall and Carter Difonzo (9-3) rallied from an early 1-2 deficit in the opening set to a 6-2, 6-1 win over Woodland’s Alex Bunta and Hayden Lusk on the back of seven service break games. The No. 2 doubles team of Jake Busch and Eshaan Agrawal played nearly flawlessly to win 6-1, 6-1 over Woodland’s Max Costlow and Nick Warren to improve to 3-0 overall and placed some pressure on Woodland which trailed in the match at 2-1. Bryce VanOrder rallied from a first set 6-3 loss to split sets with Chamblee’s Allen Howell (11-4) for 7-5 second set victory to force a third set. Meanwhile Chamblee’s Sam Lehman (10-2) had quietly won the first set of his No. 3 singles match 6-1 and led the second set 5-1 before Woodland’s Connor Gunnell put together three straight game wins to pull within 5-4. Lehman would serve out to win the set and clinch the match by putting the Bulldogs up 3-1. Howell went on to defeat VanOrder 6-1 in the third set to make the final margin of 4-1. It is the Bulldogs first time to advance to third round of state tournament play since a finals appearance in 1999 which followed their 1998 Class 2A state championship. It also evened Chamblee’s state tournament record at 13-13 all-time. Chamblee will face Region 3 No. 2 seed McIntosh, a 4-0 winner over Bainbridge in the second round, on a date and site to be determined. Tucker has only reached the girls’ state tournament five times and with the Lady Tigers 3-0 win over Richmond Hill on Wednesday advanced to the quarterfinals for the first time in program history. Tucker’s Autumn Clemons (10-1) was victorious at No. 1 singles with a 6-2, 6-1 straight set victory while her younger sister Summer Clemons (14-1) cruised to a 6-0, 6-1 win. Trinyty Turner and Jade Warupa closed out the match with a 6-3, 6-0 decision at No. 2 doubles. Tucker now must take on Region 7 No. 4 seed John’s Creek which defeated Harrison 3-0 in the second round. A date, site and time have yet to be determined. In other Class 6A action, the Dunwoody Wildcats (13-7) swept Harrison out of the state playoffs with a 3-0 decision in boys’ Sweet 16 play. Dunwoody moves on to face Region 2 champ Glynn Academy, a 5-0 winner over Heritage-Conyers, at a date, site and time to be determined.